A lot of users are satisfied with how the Under Armour Curry Lux performs. They are saying that it is as good as the performance model. Some wearers just love how the shoes look, and they claim it goes well with everything. The Curry Lux feels very comfortable and can be worn for hours, several declare. Like the Air Jordan 1 Retro High, a few buyers are saying that they exclusively use the shoes for casual wear because it feels great on-foot and is made of premium materials. They’re asserting that they don’t want anyone to step on their sneakers. This shoe from Under Armour is true to size. 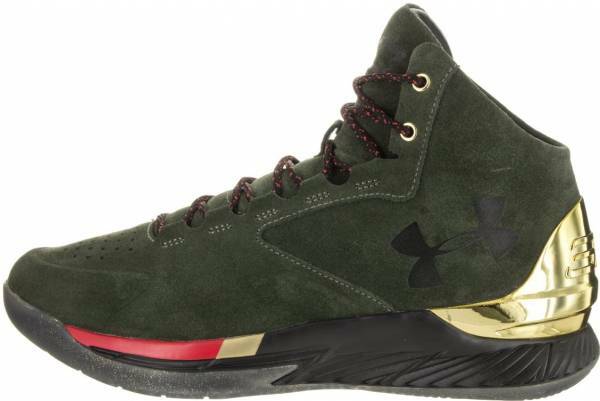 The UA Curry Lux is a little heavier and has less ventilation than other Curry performance models, a handful remark. Like some issues of the Air Jordan 12 Retro, a user is complainaing that the UA Curry Lux is poorly made . He claims that the sneakers started to fall apart after just a couple of months. Inspired by the Under Armour Curry One, the Curry Lux executes just as well on the court as the performance model. It is a stylish and comfortable basketball sneaker that most Stephen Curry fans would want to get their hands on. The Under Armour Curry Lux collection is an exclusive set of lifestyle sneakers based on the Curry One. It features either a rich leather or premium suede upper for luxurious comfort and MVP caliber style. Cushion. The Curry Lux features a Charged Cushioning midsole that provides a plush feel for exceptional comfort on and off the court. On-court, the Charged Cushioning midsole is designed to convert impact into responsive quickness. Traction. The outsole is made of redefined iced rubber with a multidirectional traction pattern that provides excellent grip. Length and Width. The Under Armour Curry Lux is advertised as true to size. Buyers are advised to order their actual size. Lockdown. The Curry Lux features a metallic heel counter that secures your foot and stops it from sliding. A TPU midfoot shank wraps under your foot to provide additional lateral stability. To reinforce the idea of luxury, the Curry Lux features either a mix of rich leather or a premium supple suede upper complete with metal eyelets and noticeable stitching throughout the sneakers. Influenced by Stephen Curry’s style on and off the court, the Curry Lux carries with it a sense of polished refinement and sleek athleticism. This street-fashion inspired footwear is a straightforward and honest translation of Curry’s first signature shoe. A must-have for fashion-forward men, this signature collection includes a mix of low- and mid-cut styles constructed from rich suede or premium leather, all formed into the silhouette of the Curry One. These off-court sneakers are available in five fresh combinations of tonal colors and finishes.